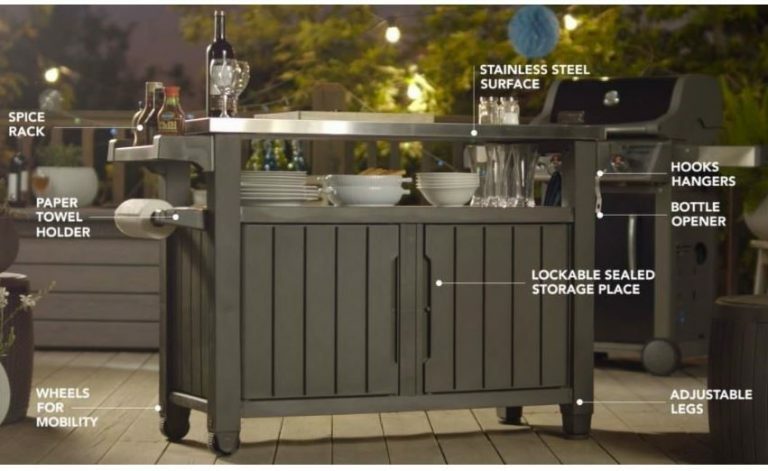 Keter’s outdoor BBQ storage table provides the perfect decay-resistant apparatus to assist alfresco grilling meantime provides a hygienic stainless steel surface for food preparation that’s a jiffy to disinfect. 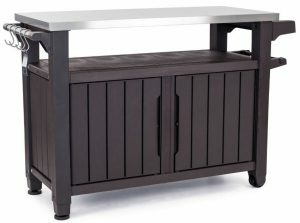 Favourably, Keter’s Unity equips the barbecue deck with an all in one, handy, stylish & weather-resistant serving cart that can be wheeled into position to effectuate food preparation whilst entertaining guests, besides being surrounded by all your foodie accessories and storage compartments underneath. Following the popularity of Keter Cool-Bars, Unity carts are intentionally designed to satisfy different tastes & locations. Two sizes showcase two shades, presented in either graphite grey or espresso brown. The smaller Unity offers a square top, one shelf & single cupboard underneath that’s ideally-suited for locating in restricted patio spaces meanwhile the larger model, termed the XL Unity doubles up the surface area into a large rectangular table comprising a spacious shelf & twin-door storage cupboard down below. On account of my Butchery background, when searching for a food prep station, a hygienic surface headlines the list. Just like ensuring a probe, knives & grilling equipment maintain bacteria-free, achieving a sterile surface for food preparation should be instant and kept that way. The Unity is fitted with a 430-grade stainless steel top. When considering the most sterile material between wood, polyethylene plastic, marble and stainless steel, the latter comes out on top in my book. 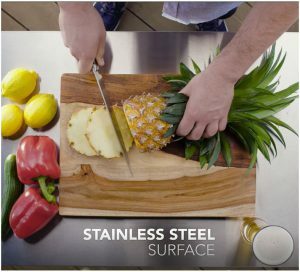 A simple spray & wipe over with anti-bacterial solution disinfects the surface in an instant to accomplish hygienic food preparation, although it’s never advisable to cut on a stainless steel surface, a cutting board provides the ideal surface. On the whole, Unity feedback comes across very well however a few downgrades are frustratingly provided due to annoying damages and missing parts which is rather puzzling. Personally, I wouldn’t accept a damaged delivery and if I was unlucky enough to open the box to find damaged or missing parts, I would contact Keter immediately for them to sort the problem rather than put the onus on the seller. Telephone support numbers are presented in Keter’s instructions or you can contact them online. We’ve discussed the stainless steel manufacture that covers & lips around Unity’s entire top serving as a table however stainless steel also resists corrosion which assures weatherproof defence when stood outside suffering the downpours meanwhile immediately disinfects for food prep using anti-bacterial wipes. The rest of Unity’s construction including the cupboard, shelf, doors and frame are manufactured from environmentally recyclable polypropylene therefore when it’s time to upgrade & replace, this resin can be re-manufactured into alternative plastics. Merging with the resin entails the colour pigments of either espresso brown or the deep anthracite shade of graphite grey beside being strengthened with UV protection to stabilize the manufacture from the intensity of sunburn damaging the composition with fractures and colour-bleach. After mixing the resin ingredients, Keter’s innovative moulding procedure forms a chunky walled composition for sturdiness simultaneous to artistically creating the guise of a wooden structure including panelled doors & shelf, simulating details of a coarse wood-grain texture to the touch. A polypropylene make-up is designed to remain unaffected when suffering diverse weather changes from rainfall showers to blistering heat and damp conditions meanwhile it’s not susceptible to capitulating through rot ‘n’ rust therefore never requires conserving with preservative wood-stains or paints to freshen appearances & nurture. Freshening-up Unity’s presentation is as simple as wiping over with a damp cloth soaked in warm water comprising a squirt of cleaning solution such as mellow detergent or washing up liquid further to disinfecting the top as previously described before preparing food. Other than that, they’re maintenance-free. Moving Unity’s portable serving cart from positioned in the corner of the patio deck to the desired spot, next to the BBQ and close to friends, is assisted by two castor-wheels installed onto one side. Similar to Keter’s Comfy deck box, you lift the opposite side and push to locate. Once positioned, the inevitable wobbly table usually results which becomes frustrating when cutting food, however, Keter has cleverly installed two adjustable feet on the opposite side to the wheels. Steadying the table to prevent rocking simply involves spinning both foot washers to evenly stabilize. Food preparation requires a cutting board. Knives blunt very quickly cutting on steel furthermore it’s easily scratched. Simply put, it’s not designed for cutting on meanwhile positioning any wood block or plastic cutting board on stainless steel usually skates around like crazy due to the highly polished surface. We find resting the cutting board on damp cloth laid flat, admirably cushions to stop the slip. 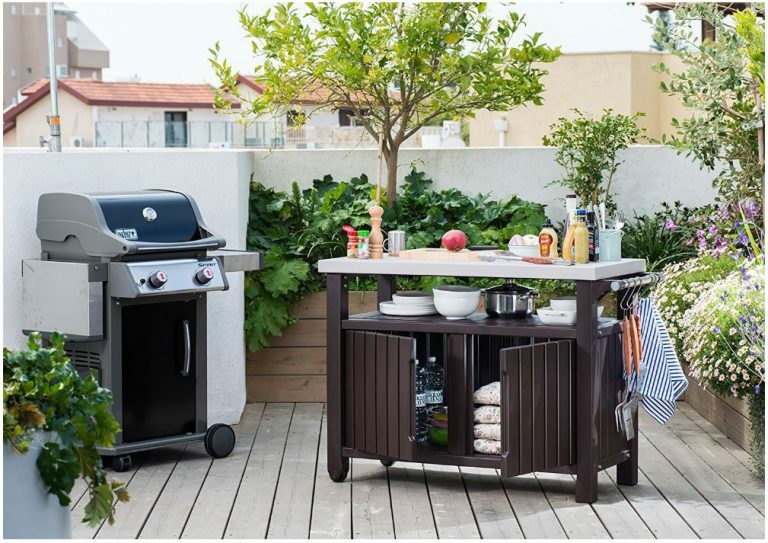 Underneath the table-top situates a shelf for conveniently placing plates, cutlery, glasses & cookware meanwhile under the shelf a decent sized cupboard provides plenty of space for storing BBQ grilling tools along with fire-lighters, fuel and charcoal. Including the shelf space, the small Unity accommodates 40 Gallons of storage capacity whilst the XL holds up to 78 Gallons. The cupboard doors are pad-lockable overcoming the solution to stop doors blowing open in windy weather, thereby protecting storage by maintaining dry internal conditions when not in use. Incorporated into one side situates a sidebar for locating the included bottle opener & 4 S-hooks for hanging grilling tools & tea-towels meanwhile on the opposite side, a spice rack equips food preparation by accommodating seasonings, spices, sauces & ketchup for dining convenience together with a paper towel holder positioned below for handy wipe-ups. 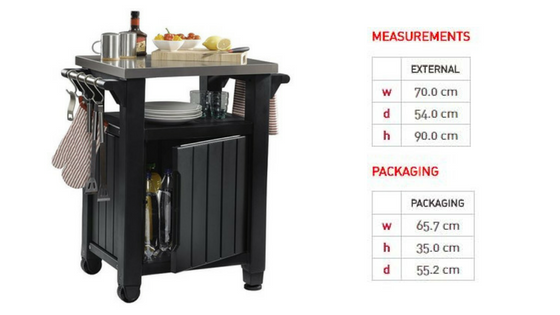 Combining all these multi-functional services together the Unity storage cart provides the perfect height for food preparation, a drinks bar, alfresco dining and entertainment services to accompany BBQ get-togethers. Constructing both Unity entertainment carts involves working your way through a series of steps implementing the procedure demonstrated in the instructions. Similar to building flat packed furniture albeit most parts here simply click together. The only tool required is a Philips head screwdriver for driving in 12 screws meanwhile an Allen-key is provided for securing 8 additional hex style screws. Feedback’s impressive with regards to how clear the assembly process is, aided by embossing the instruction label onto each part during moulding. 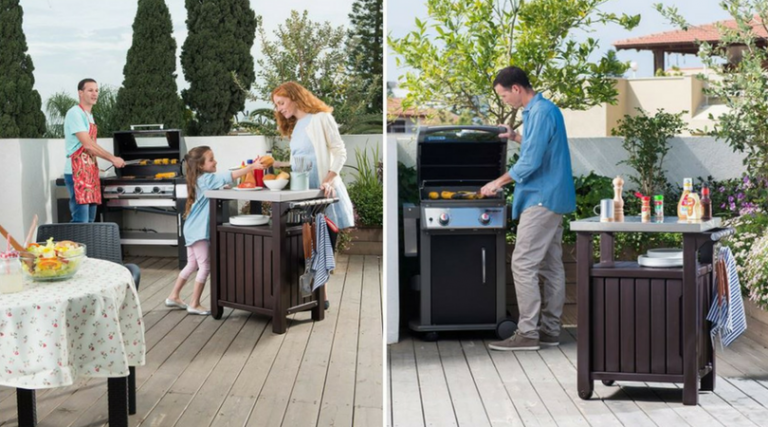 Providing the perfect accompaniment for BBQs, Keter’s inexpensive Unity can be wheeled into position next to the grill meanwhile food can be prepped on the most sterile of surfaces whilst chatting to guests. Everything foodie is conveniently stationed at your fingertips suchlike sauces, seasonings, spices & ketchup meanwhile hooks & bar provide a place to hang towels & grilling tools. Underneath lays a handy shelf for storing plates, cutlery & cookware whilst the cupboard below accommodates additional BBQ accessories. The Unity is the perfect height for food prep, a solution to chat whilst cooking, alfresco dine & serve as a drinks bar, moreover the two years warranty & rot-resistance delivers peace of mind & escapes conserving. Both sizes are popular entertainment stations. 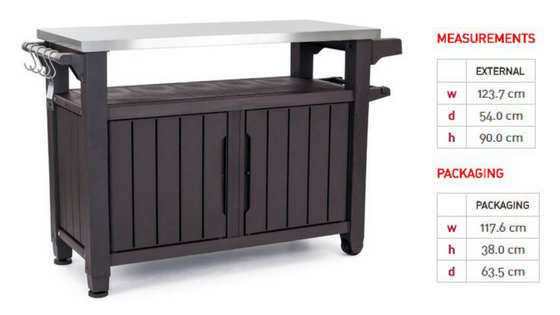 Hope Keter’s outdoor BBQ storage table delivers inspiration for your alfresco foodie grills. 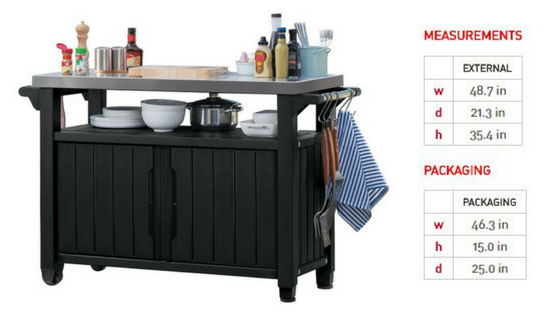 Share your favourite food-prep serving cart below along with any Unity queries. Please share Keter’s Unity carts. Thank you. Wow, this is such a great idea. I have seen many sheds, small and large but this bbq storage shed is amazing and it is a must have for everyone, I am going to order it straight away. Thank you Simon for sharing this amazing and superb product with us. I am going to share it with everyone I know who love to do bbq at home and have little space. This is such an amazing thing for everyone to have. Hey Sarah, thanks for calling in to checkout Keter’s BBQ food-prep storage carts. Their main objective is to provide convenience in the way they are able to park in the corner of the patio, suffer the downpours whilst maintain a dry internal preserved atmosphere for keeping storage meanwhile are able to quickly wheel into position next to the BBQ in front of guests to enable food preparation whilst entertaining. 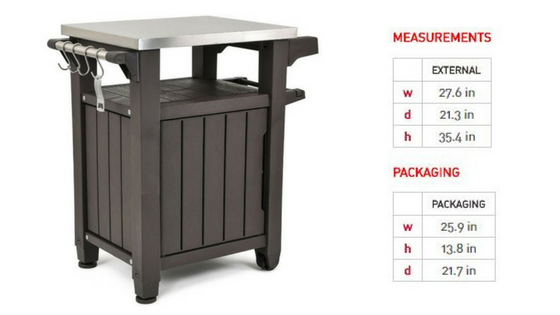 Previously, most of us disappeared into the kitchen to prepare, these tables conquer those issues. Thanks for sharing with your social media friends Sarah, every little bit helps spread the word. I find Facebook, Twitter, Google+ and Pinterest currently the most popular Social media platforms where visitors share with their friends. What a great post! You have covered every question I would ask. Thorough review of the Keter Unity food prep cart. Being an Aussie who lives on the beach this kind of thing is right up my alley haha! I love the fact it has the two adjustable feet to stop the wobbling. That is a real pet hate of mine. I can already picture this cart on my patio. So versatile. Thanks so much for a really interesting and valuable post. 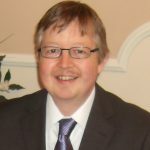 Hey Kevin, thanks for visiting to read the advantages Keter’s food prep carts delivers to BBQ decks. There’s no doubting you Aussies are experts when it comes down to barbecuing and alfresco dining whereas we Brits just make the most of the sunshine by lighting the BBQ during the summer months when the skies turn the tap off – ha! Yeah, there’s nothing more frustrating than cutting away & preparing food on a rocky table, drives me mad also. Having wheels one side allows you to park the cart in the corner of the yard when not in use meanwhile takes an effortless roll into position next to the barbie and in front of friends to prep whist chat. Once the cart is in situ, simply spin the feet to level and stop the rock. This is by far the most comprehensive article I read so far today. You have pretty much answered all the questions that came to my mind. That was very impressive. My husband loves to barbecue. We both enjoy outdoor activities. I love how the outdoor BBQ is able to store so much stuff. Things like, knives, dishes, bowls and much more. That is super handy when cooking food outside. I always share your articles with my husband. So I will share this detailed and awesome review with him. Thank you so much for this information. It was very helpful and informative. Keep up with the good work. Hi Hong, thanks for stopping by to explore Keter’s two sizes of Unity food-prep entertainment stations. And thanks for your kind words. My first day writing an article usually entails gathering all the information followed by creating a design plan for the post’s presentation. The next day I write the article and present the information clear & concise meantime place imagery and embed the manufacturer’s video if one is available. Yeah, my wife & I are BBQ addicts also Hong. As soon as the weather warms up & the sun shines on a weekend we prepare the alfresco grill and usually gather a few friends around & entertain. Preparing meats & veg for the BBQ along with salads, burger buns and additional complementary foods usually takes place in the kitchen due to not having enough preparation space outside therefore you’re missing out entertaining. 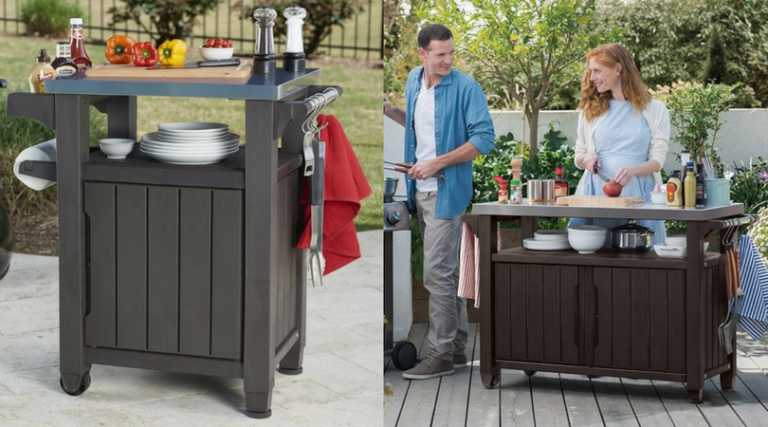 Equipping the patio with a food-prep cart that can handily be wheeled next to the BBQ occupying all necessities from cookware & grilling tools, plates & cutlery to sauces & seasonings meantime dispense paper towels & hang tea towels conveniently assists in food preparation whilst you grill away and chat to friends. Wow, you’ve basically covered all questions a buyer would have in mind in looking for a product like this, good job! I love outdoor activities, especially picnic and going to the beach and parks and almost all the time, we have BBQ. I myself love everything in order and all ingredients and materials needed prepared so this one is actually very attractive, not to mention the ease of cleaning and disinfecting the surface. The fact that it’s easy to assemble is also a plus, plus for me. Hey King Kong’s Girl, thanks for stopping by to read about the two sizes of Unity food-prep entertainment stations. Yeah, we love been outdoors too. Any excuse to alfresco dine or BBQ on the patio and the outdoor furniture’s set up & ready in minutes. We many times watch programs where people escape the UK to live overseas in places like Spain. I don’t think we’d ever sit indoors and eat meals if we lived in a warm climate. That kind of lifestyle would suit us down to the ground, the kitchen would remain immaculate – ha! My wife & I are a bit OCD when it comes down to being organised. Unity’s design whereby it organises all your plates, cookware and grilling tools along with spice racks to store sauces, seasonings & ketchup epitomizes convenience meanwhile when anything’s spilt or needs wiping up, tea-towels are hanging on hooks or the paper towel holder’s ready to dispense. 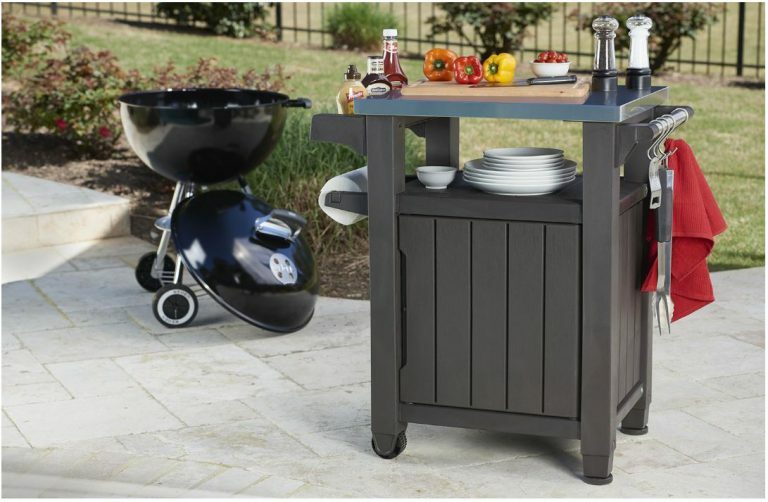 Unity carts aid multi-tasking: Preparing food on a sterile surface during chatting with friends & grilling away on the BBQ meanwhile either size serves most our needs and like you say, they don’t take long to assemble. There’s the odd screw that requires driving in, however, in the main, the whole thing snaps together. 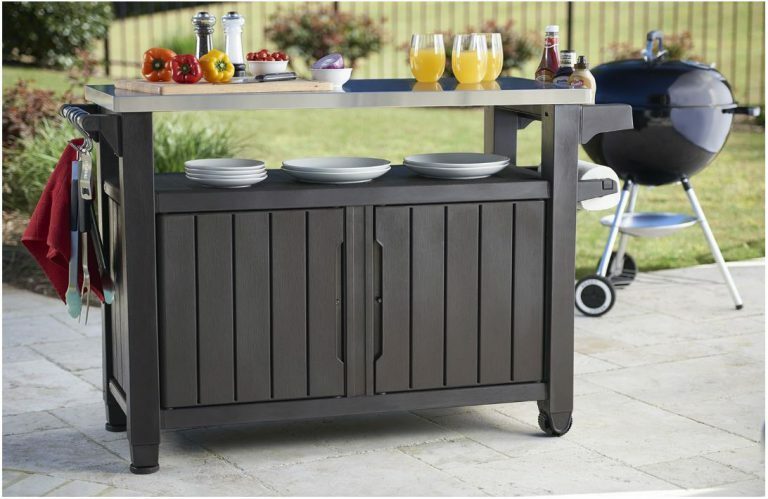 Honestly, I never thought about having an outdoor BBQ storage table. But I think it is one of the items that you do not think of until you realize how much it will save you time. For example, we have a patio and we usually grab plates, dishes etc in separate trips from the house. Now, how convenient will it be to load everything in that little storage table and wheel it to the patio! We do not do barbeque very often, so we are particularly interested in a small unit. Hey Anna, thanks for stopping by to read about the benefits Unity serving carts deliver to the patio. You sound like us, running in & out of the kitchen preparing food to barbecue, making salads & cutting the burger buns etc meantime grilling away on the BBQ in-among. Unity carts remove all the hassles. 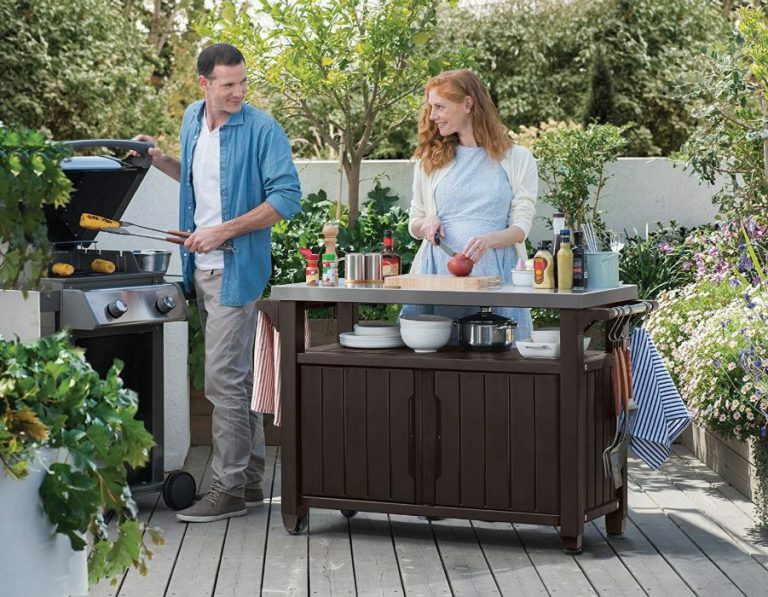 They simply wheel into position to occupy all your accessories, sauces, plates and equipment at arm’s length so you can prepare food whilst chatting away to friends & barbecuing; the reason it’s called an entertainment food prep station. I love barbecuing. Problem is: warm & dry sunny weekends can’t be relied upon over here in the UK. Most of us check the weather forecast Friday night, then plan the BBQ shop for the weekend if it’s going to be fine. 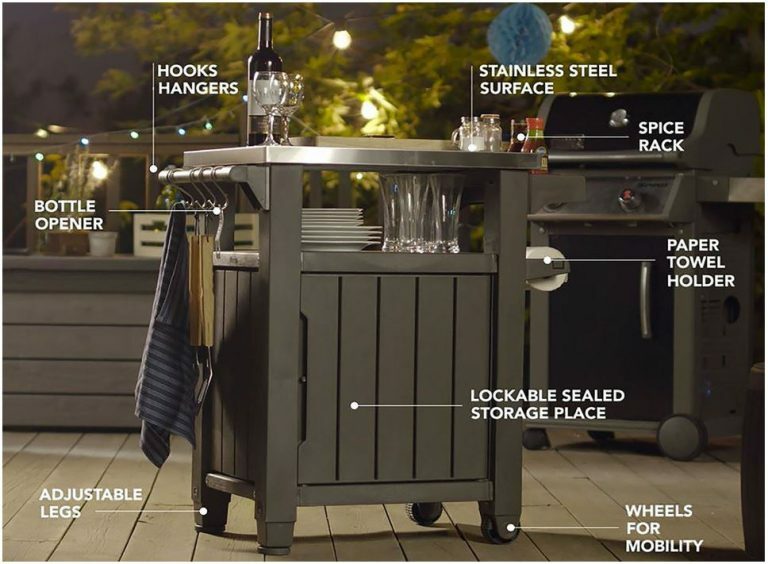 Having the Unity cart stationed in the corner of the BBQ deck delivers convenience in being able to quickly wheel, locate & disinfect whilst you light the BBQ. A handy accessory to have for the occasional Alfresco grill. Hi Jyl, thanks for dropping by to inspect Keter’s Unity food prep storage tables. You can’t beat stainless steel for maintaining sterile conditions on a food preparation surface. A spray & wipe over with the typical anti-bacterial solution found in all supermarkets instantly disinfects the surface ensuring hygienic conditions are met. The shelf provides plenty of space for conveniently storing plates and cookware meanwhile the cupboard is plentiful for accommodating all those BBQ necessities meanwhile the doors are lockable therefore help maintain storage in fine fettle when the Unity is not in use & stationed in the corner of the patio deck suffering the elements. Yeah, many patios including ours have uneven floors. Having the option to evenly station using the adjustable feet makes food preparation so much more enjoyable when barbecuing and chatting to guests. The polypropylene makeup is entirely recyclable meanwhile it never decays no matter what weather it suffers plus a quick wipe with a damp cloth immediately freshens-up Unity’s presentation. I suppose the size of Unity depends on how often one barbecues and whether you’re frequently entertaining guests. The small one certainly parks unobtrusively in the corner of the BBQ deck meanwhile both contain all the handy add-ons to aid alfresco grilling & dining. 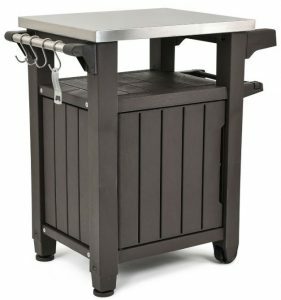 Simon, it’s amazing how things happen… Just this past weekend, my husband was talking about getting an outdoor BBQ storage table! Of course, it’s that beautiful time of the year when we gather friends outside and have great laughs over barbecue and soft drinks. So the timing is perfect! I’ll make sure to show your (very thorough) review to him. I have to say that the Keter Unity is beautiful and I love the fact that it’s fitted with a hygienic 430-grade stainless steel top. Hi Elaine, thanks for visiting to read the advantages of Keter’s Unity food prep serving carts. Yeah, Spring’s certainly here over in the UK. Last week we had our first BBQ of the year. Bank holiday weekend unusually was a scorcher, there was a real charcoal odour drifting around. I adore that authentic barbecue aroma. Unity Entertainment tables act as a helpful assistant when barbecuing. Having storage room for accessories, a shelf for cutlery & plates, a spice rack for sauces, seasonings & ketchup, bottle opener, paper towel holder and hooks to hang grilling equipment delivers ultra convenience to alfresco grilling meanwhile like you mention, the stainless steel worktop disinfects in a jiffy which is paramount for food preparation.